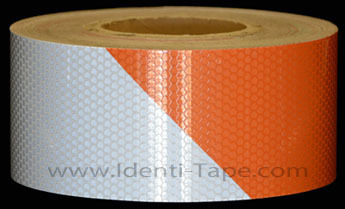 Below: 3M GA1616 Reflective Gate Arm Tape. The US DOT FHWA Manual on Uniform Traffic Control Devices (MUTCD) 2009 Edition, Section 8C.04, Paragraph 05 states "Gate arms shall be fully retroreflectorized on both sides and shall have vertical stripes alternatively red and white at 16-inch intervals measured horizontally". 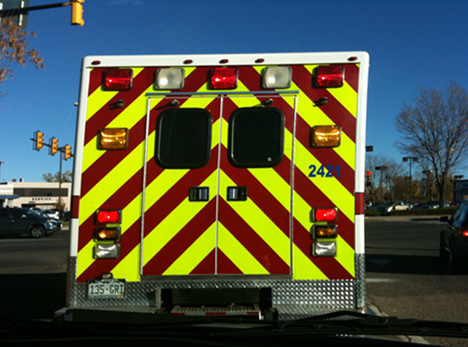 Below: 3M 3310 and 3314 Type III Reflective Workzone Sheeting for Barrels and Barricades. 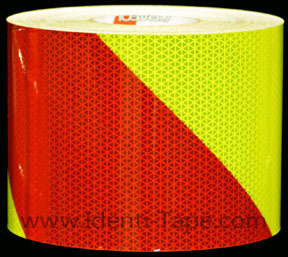 3M 3310 and 3314 are flexible, prismatic lens type reflective tapes. They have an aggressive acrylic adhesive with a peel-off backing. They meet all ASTM D4956 Type III requirements. They are designed for use on plastic and semi-flexible plastic traffic control barrels. Both are available in 4-inch and 6-inch widths. 3310 and 3314 withstand the rigors of work zone environments, such as impacts, scratching and gouging, and rough handling during transport and storage. Rolls are 150 feet long and take about 5-7 business days to obtain from 3M. Also available in yellow and red. 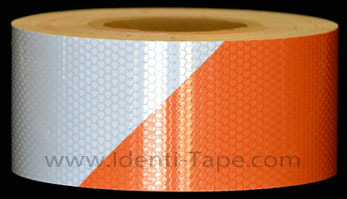 Below: Nikkalite Type III High-Intensity Ultra-Lite Grade (ULG) Orange & White Reflective Barrier & Barricade Tape. 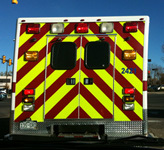 ULG is a flexible, 11-mil thick, encapsulated lens (glass-bead) type hazard-striped Type III reflective tape. 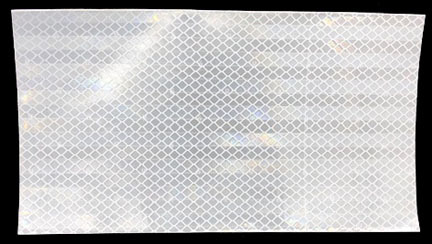 It has an aggressive permanent acrylic adhesive with a peel-off backing . Meets all ASTM D 4956 requirements. 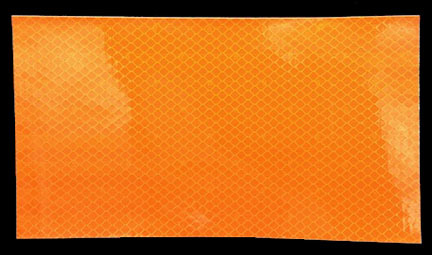 This striped reflective tape has 6" wide stripes and is ideal for hazard warning barriers, road-end reflective barricades, and any equipment requiring high visibility warning. Will adhere well to smooth concrete. It is warranted for 10 years. Material has a dove-gray honeycomb appearance in daylight as seen at top of page, but reflects white at up to 250 Cd/Lux/sq. m. at night as seen below. Both patterns are also available in widths of 7", 8" 10" and 12" by special order. 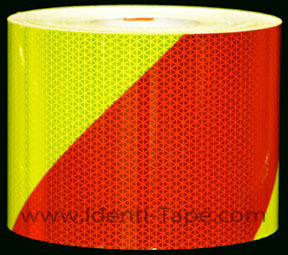 Below: 3M 3326 Flexible Primatic Grade Red & White Reflective Barrier & Barricade Tape. 3M 3326 is impact resistant and exceeds ASTM D4956 specifications for Type III and Type IV reflective material. It has 6" wide stripes and is designed for hazard warning barriers, road-end reflective barricades, and any equipment requiring a high visibility warning conspicuity. It will adhere well to plastic drums and smooth concrete. 3326 is aso available in other standard widths: 7-3/4", 8", 8-3/4", and 12". Contact us for pricing.